High-speed laser micrometers are non-contact measuring instruments that have a high scanning rate and are highly accurate. They help to inspect small, fragile workpieces at a high temperature, even while they are in motion or are vibrating. Laser micrometers are devices that are widely used for taking a precise measurement of components in not only mechanical engineering but also in several mechanical trades. The main crude micrometer was designed by William Gascoigne in the seventeenth century, as an improvement of Vernier Calipers. It was utilized as a part of a telescope to gauge rakish separations amongst stars and the relative sizes of heavenly protests. The modern version of the micrometers was invented by Henry Maudslay in the early 19th century and it helped to measure the accuracy and precision of an object. 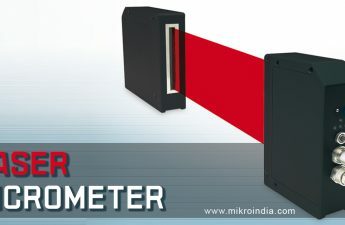 Laser micrometers use a rotating optical element in order to reflect or refract a laser beam through a measurement area and across the path of an object to measure. The part obstructs the laser light beam and thus, creates a shadow that persists for a specific time that is proportional to the size of the part. The optics in the receiver collects the unobstructed laser light beam and focuses it on a photocell receiver. The output of the photocell receiver is analyzed by electronics to detect the precise time at which the laser crosses each part edge. Each transition between the receiver detecting the beam and then not detecting the beam, or vice versa, is called an edge and marks the start and/or end of measuring sections called segments. This is done so that the differences in position of these edges define the length of each segment. The edges and fragments produced by a workpiece are numbered consecutively by the instrument and are utilized when composing projects to extricate all the essential dimensional information. All laser micrometers come with software that converts timing data into meaningful measurements and calculations. Almost all laser micrometers operate by the same fundamental principle regardless of whether they use a rotating mirror, prism, hologram, tuning fork, or some other mechanism to scan the laser beam through the measurement field. High-speed laser micrometers can use a variety of light sources such as- laser diodes, helium-neon (HeNe) laser tubes, and LEDs. The electrical interface i.e. power, signal, and status lines that reach a laser micrometer also vary amongst the class of devices. In any case, since they all work on a similar key rule, the electrical signs encode a similar essential data. WHERE ARE LASER MICROMETERS USED? 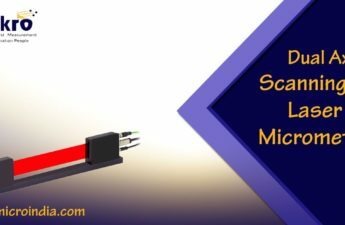 Laser micrometers assume an essential part even in the assembling procedure of an item apparently so basic as a metal wire, particularly since these days their determinations are getting to be more tightly and more hard to accomplish. They are effective instruments that enhance the efficiency of any manufacturing process and ensure the quality of the product that is manufactured. High-speed non-contact laser micrometers are used to measure and display the circumference, diameter, and ovality of any type of cylindrical object such as cigarettes, filters, cigars, etc. They are widely used in industries that design and manufacture quality assurance systems and instruments that are going to be used in analytical laboratories and manufacturing processes. They are also utilized to measure the shape of shoulders for extruded laminate tubes. Mikro is a top instrument manufacturing company that can supply you with several different types of laser micrometers that are efficient and fulfill all your requirements. The micrometers offered by Mikro are robust, easy to use and can be easily configured to fit the required application.